For behold, the Lord will come with fire And with His chariots, like a whirlwind, to render His anger with fury. The Lord is my savior i believe in jesus,i trust jesus with all my heart and soul.thank for your blessings everyday AMEN. Lord Jesus is my everything. My Parents, teacher, friend everything! I love jesus bcos jesus is with me everytime,everywhwere, in my sadness and all the things. i love jesu bcoz he took my all pain, sorrow when i m in a trouble.He shows right path to who distract frm their path. yah, i love my jesus. Because he is my saviear. And he is allmighty God. ILOVE U JESUS. HE S A ONE N ONLY GOD. HE S MY EVERY THING. HE SAVE ME FROM ALL D DANGOURS. HE LOVES ME A LOT. AND LOVES YOU ALWAYS. PLS BELIVE JESUS CHIRST. HE S A REAL GOD. Jesus Christ is real love.he his coming soon so .are you ready? I love Jesus Christ who is the Almighty Lord and God. I adore you Lord Jesus and you are my Lord, my God, my King, my Shepherd, my brother, my father,my spouse, my closest friend. I want to live for Jesus and die with Him. I love you Mother May for bringing me closer to your beloved son Jesus Christ! I love you Jesus and I want to love you more and more with all my heart, with all my soul and with all my mind. I love JESUS bcos HE perfected my life.He will give whatever I ask HIM. yes if the god is coming ,, i am ready.. I love Jesus Christ because he is a loyal friend to me.All of us know that he will never leave us alone.Praise to the god,Amen . because He is my first love and the love of my life ..
Jesus is 'LOVE'.... his eyes enlighten all my soul when i look into them. The innocence he spreads lets me forget the world.. And The HEART just says to HIm.."Oh! Christ..take my soul in your heart..and take me away with you GOD"..
Jesus is my Saviour & He is my Father also,He always cares for me & love me so much.I proud for you Jesus.You are my everthing Lord.Thank's Lord Jesus."Amen". Jesus is the Creator of heaven and earth, He is God Himself, yet at the same time bore our frail human frame on the bloodstained path to pay the price for our dark unspoken sins. Who could keep silent when such love demands recognition. I am honored to have heard the story of redemption. I am reading a book called the Desire of the Ages, whoever wrote that book really loved Jesus, they describe it almost as if they were right there!!! 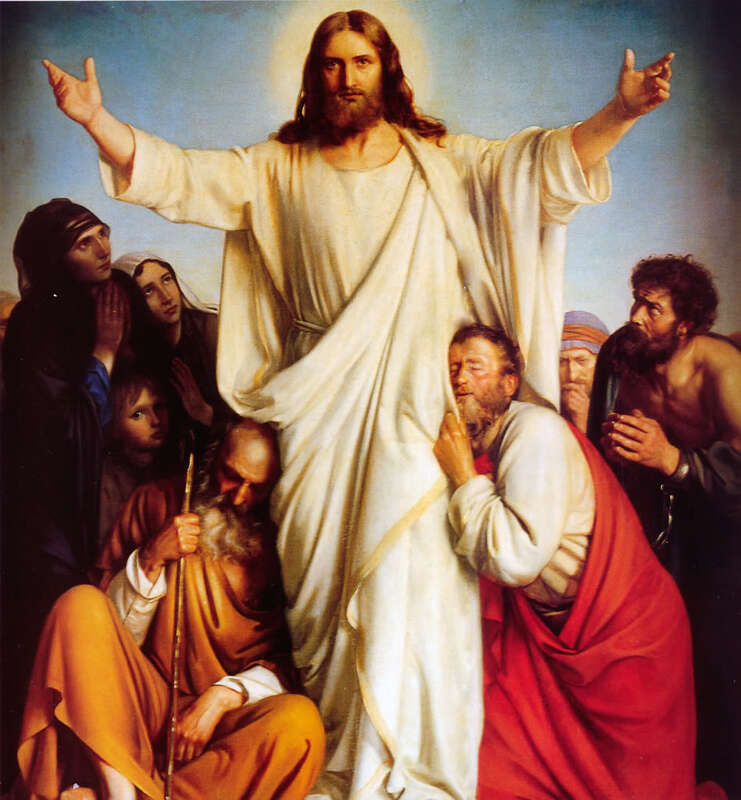 I love my lord because I forgot him,but he didnt,i betrayed him but he accepted me inspite of all the sins,when my spirit,my soul broke down,he gave me his hand so that I could hold it to stand again.I love him because he is the GREATEST!most majestic!He is incomparable.No one can prove him wrong,if anyone who reads this havent tested him,trust him just once,give him a shot with a wholehearted trust in him.You'll be answered by him..Just trust him!and nothing is impossible!simp NOTHING! waht about crucifixion???? it made me so sad!!!!!!!!!!! I love Jesus he's my lord and my king. I love him so much and i open the door for Jesus i pray for him with all my heart. I love Jesus because he died for my sins. For my sake he gave up his life. And through him I shall be safe. jesus is my saviour! he died for my sins.i keep on living just because of my lord. he loves me and cares for me at all times no matter i have anyone or not.i experienced his love.....he gives me peace much greater than anyone could ever crave for. praise you jesus! thank you jesus! jesus is the one who created the world and us. some people worship the other guy and why would you because he once was a beautiful angel in heaven but he became a showoff saying im better than god. now god punish him and made him to what he is now. ask yourself.......... how do I become an angel?